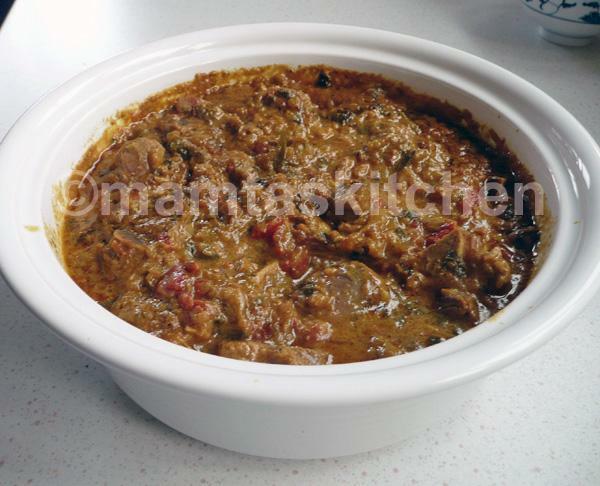 Note from Mamta: This is another easy meat curry from my friend Shashi.This dish can be cooked in a slow cooker or crock pot after step 3. Put marinated meat and everything else (except coriander leaves) together in the slow cooker and leave to cook as per instructions of your slow cooker. I cook it on high for 3-4 hours and then turn it to slow or medium until ready to eat. the garnish with coriander leaves. Peel and grate/grind onion, ginger garlic together. Mix these with yoghurt, garam masala, all the spices, lemon juice, salt and methi leaves. Add lamb and coat well with this marinade. Leave it for 3-4 hours or overnight in the fridge. Keep it in an airtight container or the smell will get into everything in your fridge. Heat oil in a heavy pan or wok or karahi. Add optional whole spices here, if used. Add marinated lamb to the pan and stir-fry on high heat for a 10-15 minutes. Add the tomato puree or fresh/tinned tomatoes, and green chillies. Cover and simmer until meat is tender and juices are dried up. This dish should have very thick gravy. You do not need to add water usually, there is enough from yoghurt and tomatoes, but if it begins to look too dry during cooking, add 1-2 tbsp. water from time to time. Serve hot with Nan, Tandoori Roti 1, Chapatti and Plain Paratha.